The products and services at Gary Overs Kennelling & Obedience are unmatched in the Moose Jaw area. Read through the details of what we have to offer below. Then, give us a call to learn more and to book your furry loved one’s stay today! Also check out our grooming services and obedience classes we offer on the grooming and obedience pages! 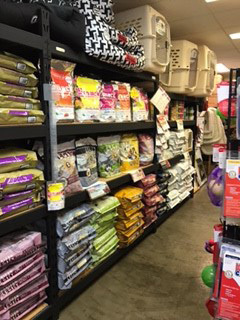 The store at Gary Overs Kennelling & Obedience carries a complete line of premium pet foods including holistic lines of both dog and cat foods. As well as pet nutrition, we carry a large assortment of treats, toys, collars, leashes, and portable kennels. A full line of biogroom products are also available for your pet care needs! Special orders are available upon request. We also offer free delivery of pet foods within city limits of Moose Jaw. All day boarders have access to our play yard! Great way to introduce your puppy to a multitude of people, sights, places, sounds, and other dogs. All socialization is done under staff’s watchful eye. This aides in helping to develop a confident and well-adjusted pet. Our kennel system has 24 spacious and heated indoor/outdoor runs, including two oversized kennels which can easily accommodate extra-large breeds or multiple same family dogs. All of our outdoor runs are fully covered from the elements and self-contained. All of our boarders have access (at owner’s request) to our fully fenced outdoor exercise compound or our separate 12’ x 14’ exercise pen. All runs are separated by non-porous puckboard to aide in prevention of visual intimidation and fence fighting. 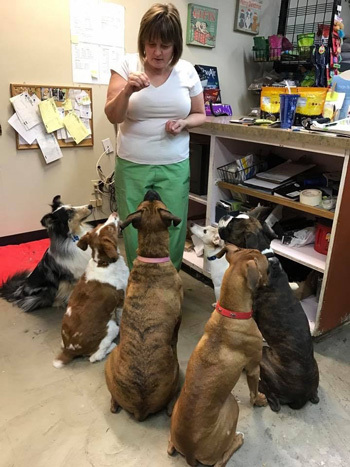 All boarders are fed premium pet food available in our store, although food may be provided from home. 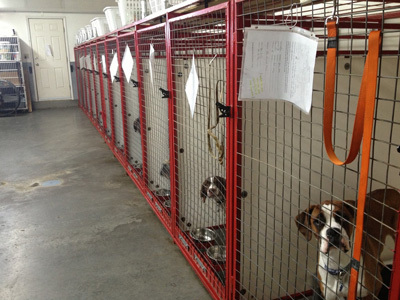 Rates are $26.00 for one dog per day, $39.00 for two dogs per day, and $49.00 for three dogs per day (GST included). Special rates are available for two or more dogs and for extended stays. All boarders staying three nights or longer will receive a complimentary bath and blow dry. Day boarding is available at a rate of $15.00 per day or $12.00 per half day. Half hour walks are available for an additional cost. If you would like to request a quote, give us a call at 306-692-6011. We encourage our clientele to book well in advance for peak seasons and statutory holidays as kennelling spaces at these times fill up quickly. A non-refundable deposit is required over the Christmas season. Grooming services may be booked for any dog during their boarding stay at an extra cost.